Walking is one of the healthiest and safest modes of travel in the United States, which is why few pedestrians think twice when traversing a crosswalk or intersection. But even the occasional pedestrian is at risk of serious harm or death when it comes to car accidents, which account for 12 percent of all pedestrian injuries, according to a 2012 national survey. The National Highway Traffic Safety Administration (NHTSA) reports that California, Florida and Texas lead the country in terms of pedestrian fatality rates, but recent accidents in Bangor and Portland indicate that Maine ‘s roadways have their own share of pedestrian dangers. Police are currently investigating two vehicle-pedestrian incidents, one of which left a woman and three-year-old child gravely injured. According to the Portland Press Herald, authorities are investigating a pedestrian accident that occurred near 238 Auburn Street – a busy, two-way roadway. The victims were a 34-year-old woman and a three-year-old child, who were both rushed to Maine Medical Center after being struck by an SUV while crossing the road. Other than being labeled “serious,” the exact nature of their injuries has not yet been reported. The accident happened at around 8 o’clock at night, when visibility may have been poor. The names of the victims and the 55-year-old SUV driver have not yet been released, but Portland police say that no charges have been filed. Officials say that speeding was not a factor in the accident, but it has not been confirmed if the pedestrians were using a crosswalk or if they were simply trying to cross the street. Even more recently, a car hit a local Bangor woman – believed to be in her mid 40’s – along the intersection of Garland Street and Broadway Street. Bangor police sergeant Rob Angelo said the incident occurred late in the afternoon, just before 5 p.m., and left the woman with injuries that were considered non-life-threatening. Additional information on the identities of the driver and victim has not yet been released. 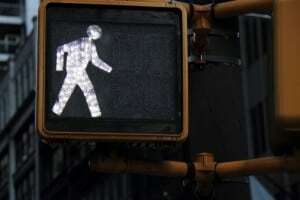 Maine law stipulates that pedestrians have the right of way on designated sidewalks and marked crosswalks. Under current Maine law, motorists do not need to come to a complete stop when pedestrians pass at a crosswalk, and must only allow the pedestrian to safely pass beyond their vehicle. This may soon change, however, if a new bill sponsored by the Bicycle Coalition of Maine is passed. The legislation would mandate that all drivers have to come to complete stop at crosswalks, rather than just yielding. Right now, some 250 pedestrians are killed every year in Maine, with one out of every four struck at a crosswalk. Hardy, Wolf & Downing offer expert legal representation to accident and crosswalk victims in Portland, Bangor, Auburn and Lewiston. We fight diligently to ensure that victims achieve justice and maximum compensation for their injuries. Call 1-800-INJURED to speak with a trusted pedestrian accident attorney in Maine.